Batwoman and Kobra in Twin Peaks!!! Before I begin, just a note. I do enjoy Greg Rucka’s comic writing. I’ve enjoyed his work with Batman and he has a deft style capable of creating a strong story. It’s one of the reasons I was (and still am) picking up the Batbooks on a regular basis. 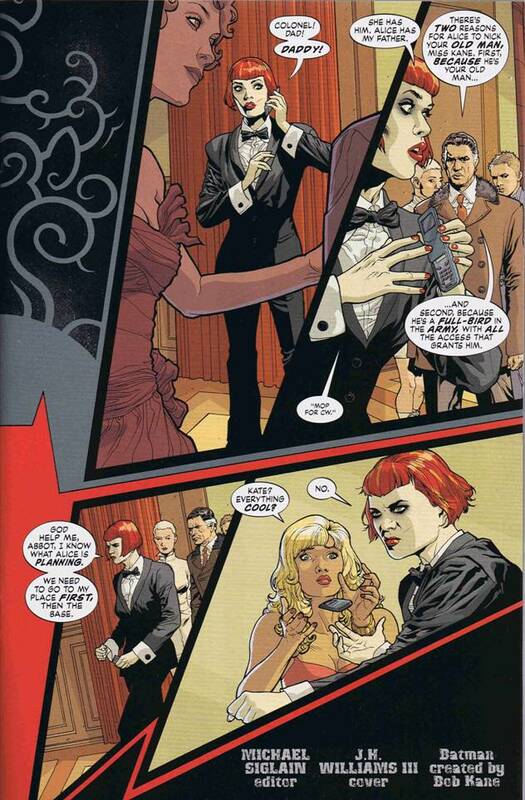 That being said, I don’t really like the new Batwoman whose run on Detective Comics recently came to a close. 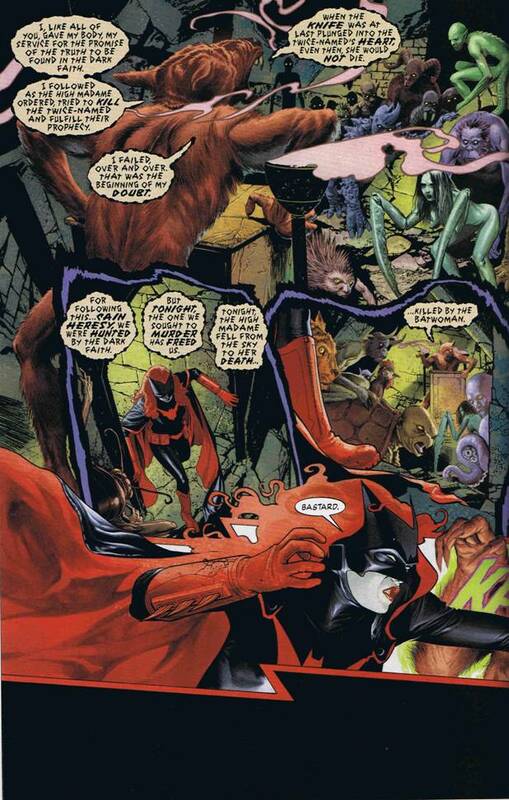 Now I know some may paint me as some sort of homophobic Neanderthal for saying so, since Batwoman’s alter ego, Kathy Kane, is an open lesbian (and kids, if you don’t know what a lesbian is, ask your parents cause I’m not going to tell you). Those people who write me off probably won’t bother reading this entry any further, and if those people happen to be the only two who visit this site, well, then I’m really screwed. However, if you’ll give me the benefit of the doubt, then please read on. Remember, I try to entertain as well as inform. 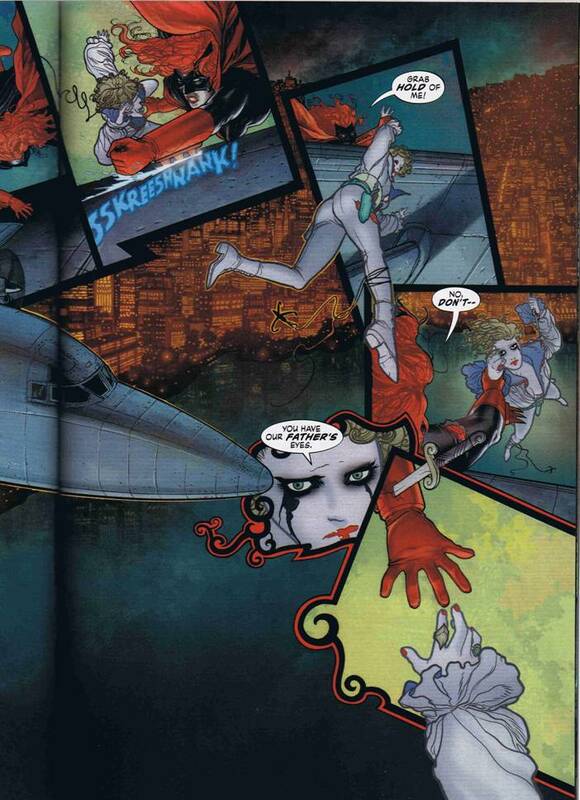 So, I’m not a fan of the new Batwoman. First question, why? Well, superficially, there’s the irksome issue of her costume. Kathy Kane looks like she has a serious pigment depletion in her skin and sports bright red hair. And when she goes out as Batwoman, her full costume covers ever bit of her body, except the extremely pale skin around her mouth and her bright red hair. That just doesn’t make any sense. Comics paint your average crook as a moron, and even a moron busted by Batwoman would be apt to think, if he ever saw Kathy Kane, that she may have some connection to Batwoman – and that, my friend, would cause problems. I know it’s comics, and comics are fantasy and style, not reality, but still, it needles me a bit. My problem, I know, and I’m trying to deal with it. The second reason was a nagging issue with the “Elegy” storyline that ran not too long ago. 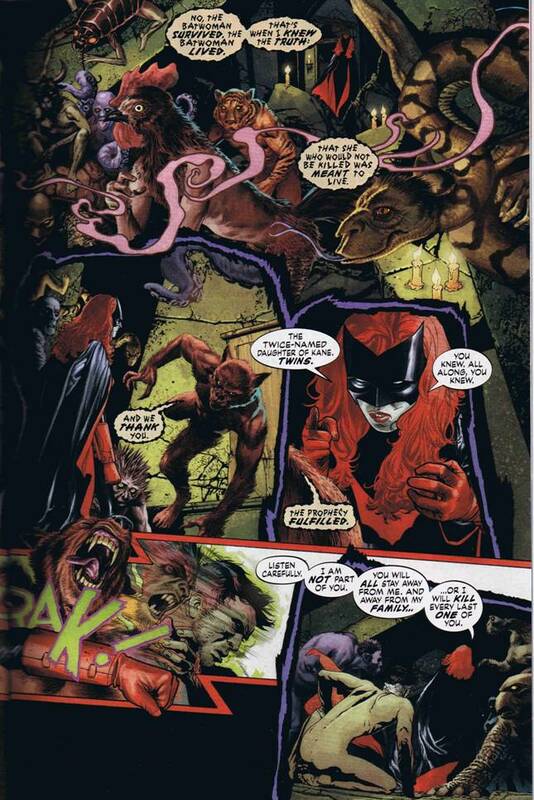 In it Batwoman had to deal with, once again, the Cult of Crime, a group of fanatics who worship crime and who needed Kathy, the “twice named daughter of Cain”, as a sacrifice in some arcane ritual. 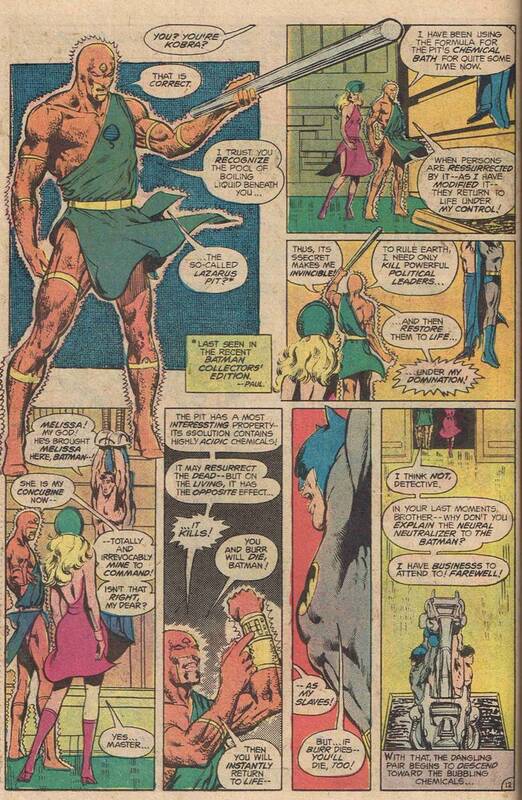 In the original encounter in DC’s weekly series 52, she managed to overcome the Cult’s assault with the aid of the new Question, although she did get a knife shoved through her chest. Kathy survived and continued her good works as Batwoman. Now in Elegy we’re introduced to Alice, a very pasty skinned, Wonderland dressed Queen of the Cult of Crime. In Detective Comics #857 Alice acts out her plan to highjack a Gotham military base… and oddly enough gives Kathy a call to let her know they have her “pappy”. Did you spot Kathy in the crowd? You know, looking at the last panel above, you have to wonder something. Comics, as I said, are fantasy. They’re creative endeavors that may be given direction by one, but are actually accomplished by a team. So think about about it. A group of people decided that the best look for Kathy would be as some sort of old school vampire. Seriously, think about it. They already made her a lesbian, why on earth did they need to add to that by making her stick out like a female Bela Legosi on every page? Well, I guess vampires are hot nowadays. That, or there’s some subtle message about lesbians and physical appearance the authors wanted to make. I don’t know. I can’t read minds. What? Were you expecting something else? Like maybe the crime worshipper’s dumping a load of religious literature on the unsuspecting Gothamites? Now that WOULD be scary! OMG!!! What a twist!!! M Night Shyamalan must be rolling in his grave over this one! What? He’s still alive? Really? Well, well, well. So Alice, the Queen of Crime if you will, was actually Kathy’s never before mentioned sister. 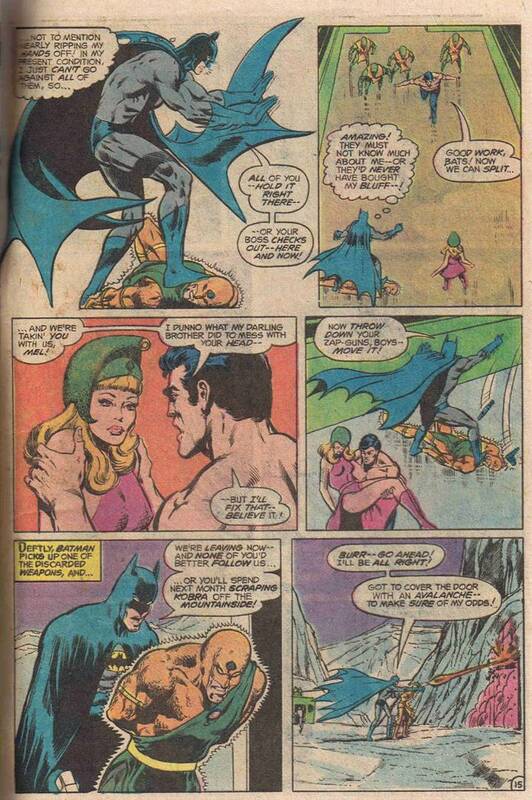 This is expanded upon in the next issue, Detective Comics #858, where we learn that Kate actually had a TWIN SISTER. Whenever a mom promises something fun for the kids, the kids would be better off staying home. It’s like THE omen of death in comics. 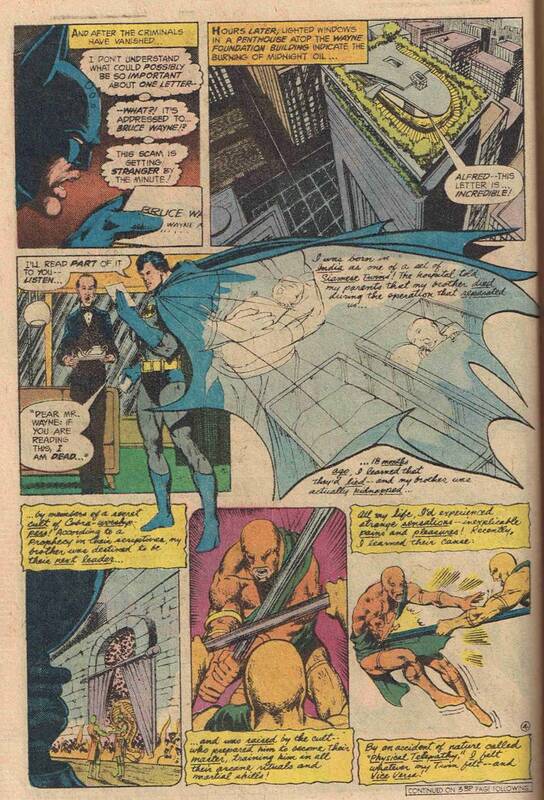 Heck, look no further than Bruce Wayne, who attended a movie with his folks the night they were killed. Sure enough, Kathy, her sister and their mom are kidnapped and held hostage. Kathy’s dad leads a team of commandos to rescue them and in the attempt it seems as though Kathy’s sister and mom are killed. 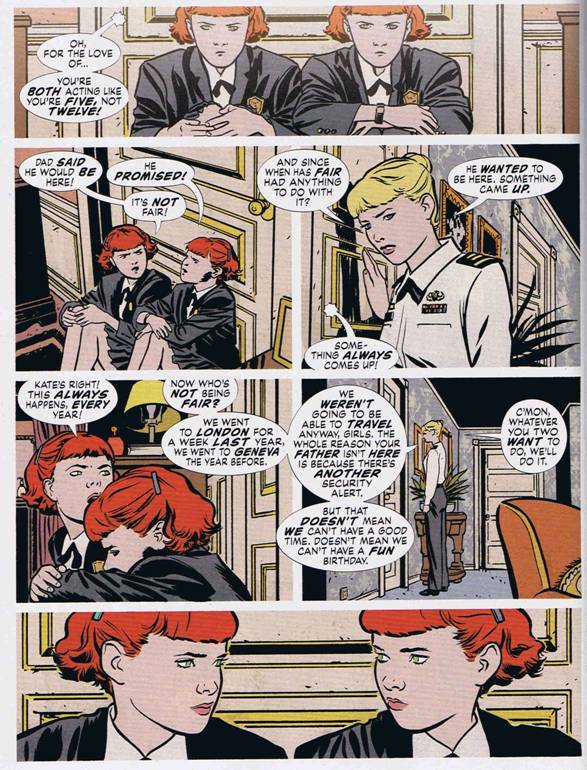 In Detective Comics #859 Kathy gets a DNA test done on some of Alice’s blood that she got from their fight the night before and finds that the DNA matches hers exactly. So I guess Kathy’s sister survived and was taken by the Cult of Crime and trained to become their white queen. No, no, no!!! I said Kobra, not Cobra! Geez!!! There you go, the World’s Most Dangerous Man! 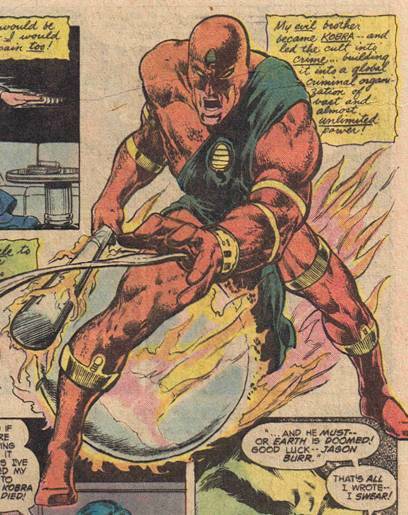 Sooo… Kobra was separated from his twin brother by a Cult of Cobra worshippers and was raised to be their leader… this sounds remarkably familiar, doesn’t it? I wonder if this was also how Cobra Commander started? It’s also funny that Tomax and Xamot have the same affliction as Jason Burr and Kobra. 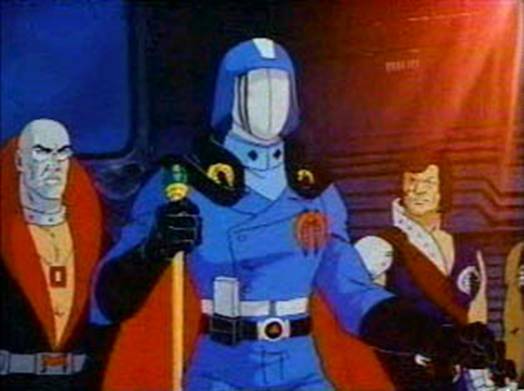 Now that I think about it, did Hasbro knock off the idea of a cobra based terrorist group from DC? So, let me see. Alice was separated from her twin sister at a young age and raised by a cult to be its leader in criminal endeavors. Kobra was separated from his twin brother at a young age and raised by a cult to be its leader in criminal endeavors. Nope, no similarity there at all. …and promptly sets off every alarm in the place and gets caught. 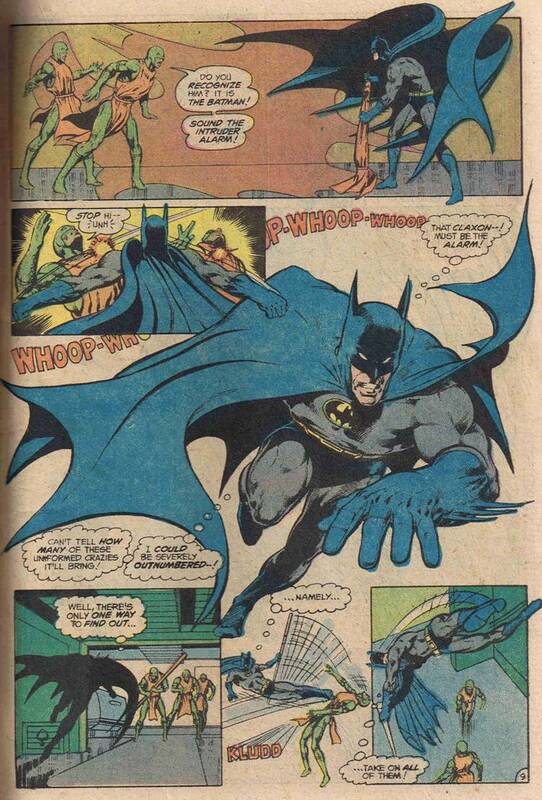 You’ve got to love Batman in the 1970s, he seemed so much more human than he does nowadays. 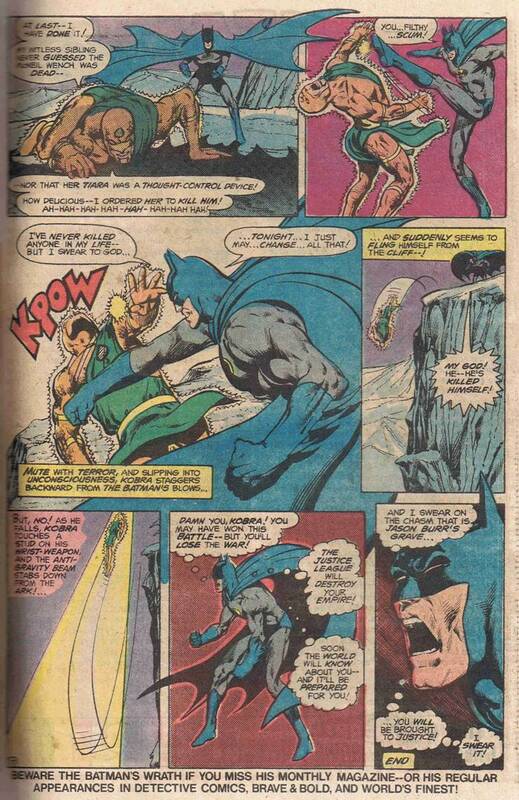 Batman awakes to find himself strung up with Jason Burr and coming face-to-face with Kobra! As noted in Austin Powers, the villain promptly explains his plan then leave the hero alone in some kind of easily escapable deathtrap. 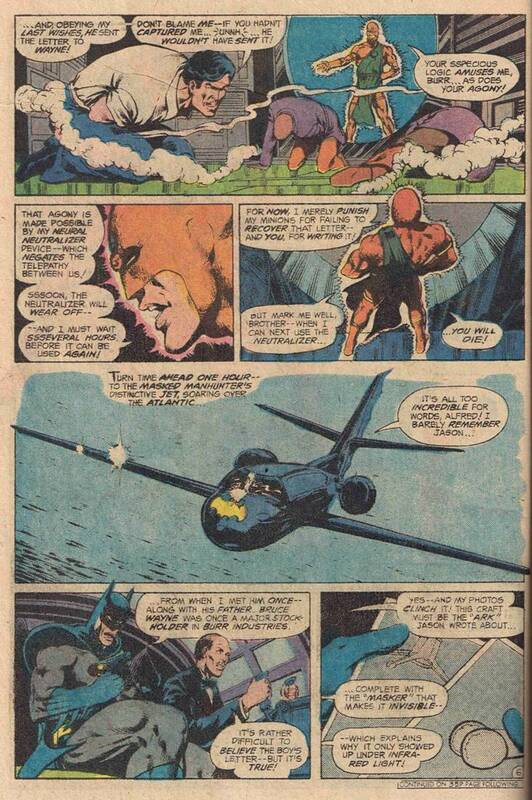 Oh, by the way, Batman and Burr escape. Another point. 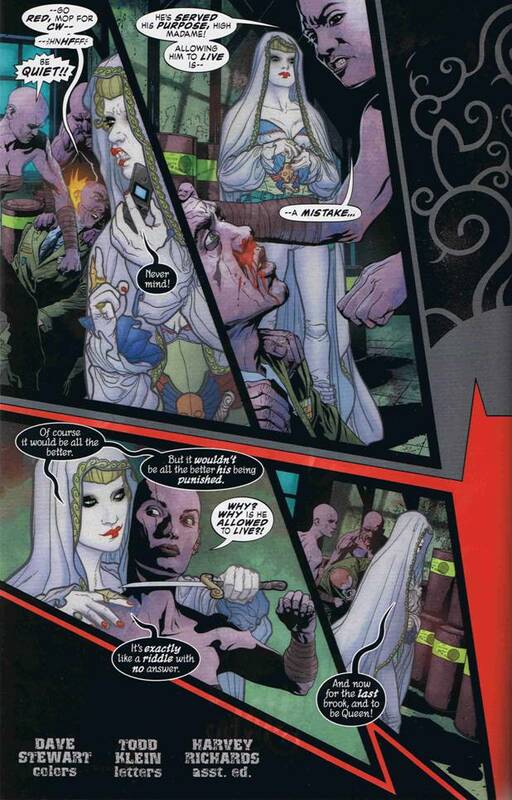 Alice’s cult seems to have some supernatural aspect as some members can change into were-creatures – and Kobra has the supernatural Lazarus Pit to raise the dead. Ah yes, you just have to love a happy ending… or is it??? OMG!!! Where the hell was she hiding that knife??? 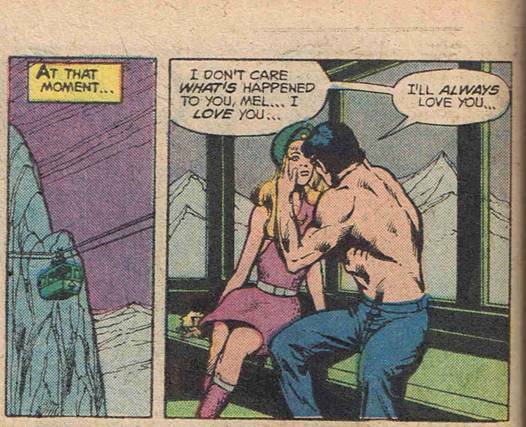 Man, what a downer ending for a 1970s comic story. Man, Batman is pissed! I’d hate to be Kobra right about now. 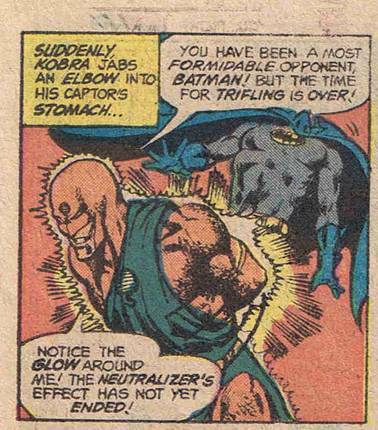 Batman would go after Kobra, but oddly enough it wasn’t in Batman, Detective Comics, Brave and the Bold or World’s Finest. He’d next clash with Kobra in Aquaman #61 of all places. Weird. 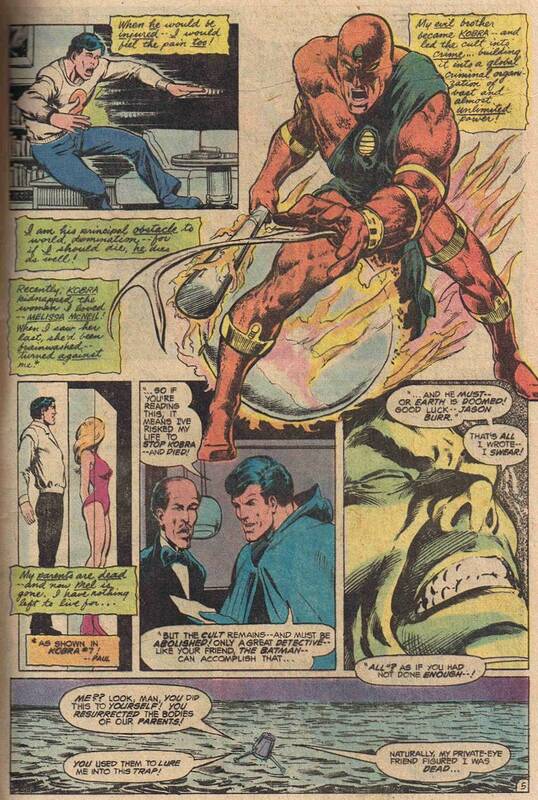 I guess after that the Caped Crusader suffered some kind of short term memory loss as he put the Kobra group on the back burner and let them fester as they’re still around in the DC universe in some capacity today, though the original Kobra leader suffered a rather grisly end in JSA #51. 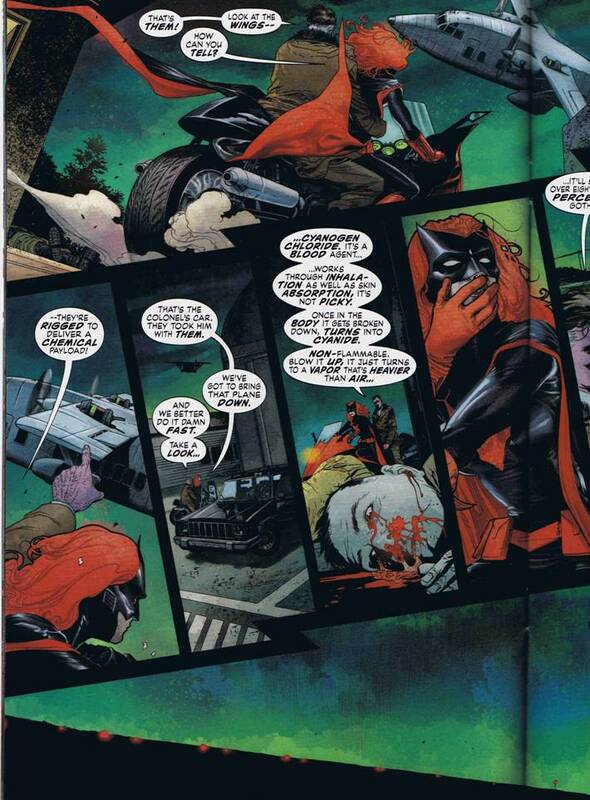 Of course, this being comics, there is no such thing as “dead”. I mean, there’s a freaking resurrection pit just sitting there! And now, I hope, you can see my point in this whole endeavor. There’s just way too many similarities between Kobra’s background and Kathy’s background for my liking. Including having one twin seemingly plummet from a ridiculous height to their death we’ve got criminal cults raising a kidnapped twin to be their leader, the “good” twin believing the other twin dead until very recently, the inevitable clashes with the “good” twin, the involvement of the Batman mythos in some capacity, the use of a parent to lure the “good” twin and so on. I suppose that, after it’s all said and done, the main reason I’m not a big fan of the new Batwoman is that subconsciously, while I was reading “Elegy”, I was just disappointed that her first solo run wasn’t more original and, well... better.